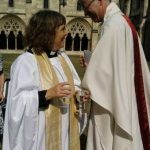 I was ordained priest 9 years ago on 4th July 2009 at Norwich Cathedral. My first celebration of the Eucharist was at All Saint’s Church Ashwicken. Today, 9 years later I celebrated Eucharist on 1st July 2018, at All Saint’s Church with a wonderful group of people. Amazing!! Time for a celebration drink and prayers for all the blessings received and the places I have been in the last 9 years.